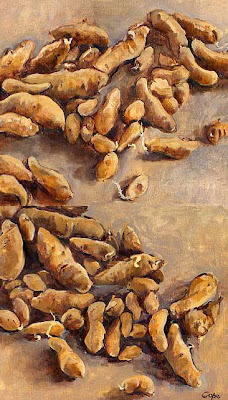 Following on the walnuts, here’s some more brown, earthy still-lives. approx 24 x 23cm (9,5 x 9 inches). ‘Semence’ in french is the name for the portion of seed kept for seed for planting next year’s crop. José Bové is a radical French ‘paysan’ farmer, who is also a political activist against genetically modified grain. A bit like Wendell Berry in the States, with his oppostition to industrial farming. I painted this as a hommage to him during his campaign against the genetically modified seed given to third world farmers. This new ‘wonder seed’ gives bumper crops but can’t give a semance (outside of the laboratory), & hence the third world paysan must forthwith buy their grain semance. In principal this would be OK for a cash crop suplus ecomony but as these are subsistance farmers, they don’t generate the surplus cash to acquire next year’s semance. Thus they fall into debt & can’t even assure next year’s semance. Some paysans give their organs to pay for this super-grain-no-semance. Whilst I don’t agree with everything that Bové believes in, I admire him for standing up for his beliefs (as well as miraculously being allowed to enter the USA with thirty kilograms of Roquefort cheese – ha! Best cheese in the world, IMO yum!). 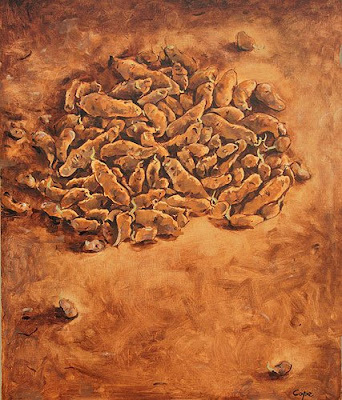 This is one of my “j’accuse” spud paintings. It’s difficult to accept an overt political discourse to a painting… but as a painter who love snature & want s to be in close contact with her… thus i cannot help but listen to the suffering & abuses that are done to her in the name of money etc. But yes, cameras are a better tool fpor the rough area of politics than poor little painting, about whom few understand & even fewer care about. I once exhibited this painting in Bergerac in the summer rush of tourist, who are mostly city dwellers & thus are far from farming. I asked one little girl where she thought seeds came from? She replied from packets, which you can buy in shops… City dwellers live far from ‘nature’. She’d never heard of semance. How I love gardening! 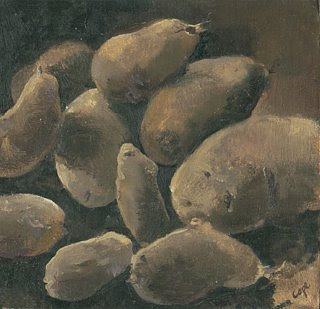 More ‘j’accuse’ spuds from a winter -bound plein-airist. Hi Adam – I’m enjoying your earthy “fall” work here. Walnut & pecan trees are plentiful in Texas, here in Sugar Land too. The walnut trees attract a weird little spider that cocoons a web around entire branches. Thanksgiving around the corner, so potatoes, pumpkins, walnuts, pecans are on our regional, traditional and seasonal menu! Jose Bove made for interesting reading and I love the Robert Hainard posts.